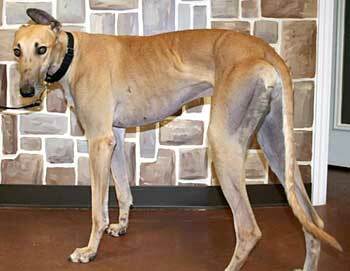 Carl, aka CL Star of Texas, is an almost 3-year-old red fawn male, born May 18, 2004. His sire is the award-winning Kiowa Sweet Trey and his dam is Rio Jade. Carl started his racing career at Corpus Christi on August 20, 2006, and finished his last of seven races at Valley Race Park in Harlingen on December 7, 2006. He is now on the hunt for his retirement family. It is not known at this time if Carl is cat or small animal tolerant. 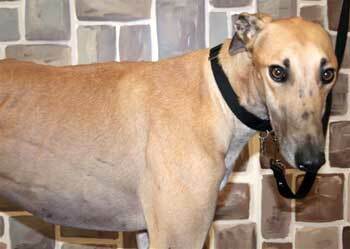 Carl is a striking fawn male with gorgeous gold eyes. His photos don't do him justice! He has filled out nicely since leaving racing behind and he looks great. He does have goofy ears which have a mind of their own when he's excited. He mastered the doggie door in no time and has had no accidents in the house. He would benefit from being in a crate during the day until he learns a little more about being a house dog. He is also very eager for food and gets rather excited at meal times. We're working on that one! But being food-motivated will make him easily trainable. He is incredibly affectionate and just wants to rest his head on you and soak up the love. He has a floor pillow that he lays on but would prefer to be on the couch or the bed if you will let him. 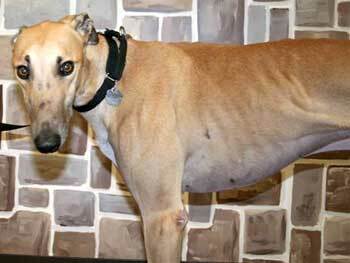 Carl is in a home with another greyhound and they get along well. Observing him around the small dogs and cats at Meet and Greets, he may not be small animal tolerant, but he has not been tested. Carl will be a great addition to any home and would probably do especially well in a home with multiple family members he can follow around.